Fat Toaster Farm is committed to preserving farming history and the well-being of ancient and non-commercial heritage breeds of animals. Nearly all of the animals dotting the landscape at Fat Toaster Farm are listed on The Livestock Conservancy’s list of “critical” or “threatened” breeds. These endangered genetics are proving to be the key to the success of the burgeoning sustainable food and farming movement as well as offering a diversity of genome that can contribute to therapies and cures for currently unmet diseases. 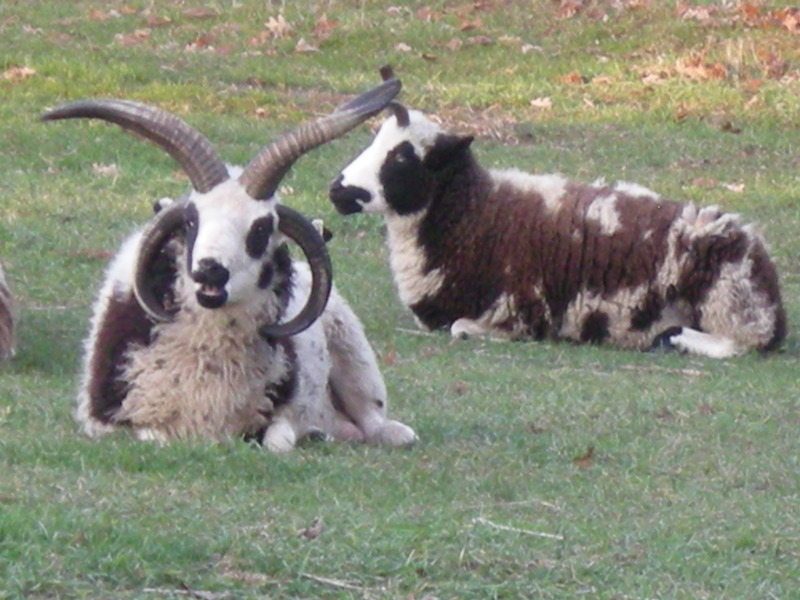 Jacob sheep are a unique, spotted, multiple horned sheep breed that attract immediate attention wherever they go. In the United States, they are currently raised primarily out of concern for conservation of a heritage livestock breed, for production of hand-spinning wool, and as easy-keeping additions to small family farms. Jacobs are always white with either black or brownish gray spots. Both rams and ewes have either two, four, or more rarely six horns. They are a relatively small breed, with medium textured wool 3 to 6 inches long, and bare legs and faces. They are hardy (in our Michigan winters they have access to the barn, but often choose to be outdoors), disease resistant, tend to be good mothers, and are long-lived. Hand-spinners enjoy making use of the natural-colored multi-hued wool, which can also be felted or used for blankets or similar projects. Much has been written about the origins of the Jacob breed. While not all of that information is consistent, it is clear that the breed was developed in Great Britain as early as the 1700’s, possibly by crossing primitive British breeds with sheep from other parts of the world. AMERICAN Jacobs were initially imported from Great Britain in the 1960’s and ‘70’s. possibly with a few earlier imports. However, there was no established breed association or registry until the Jacob Sheep Breeders Association (JSBA) was organized. That registry was opened in 1989, and while there are others, it remains the largest in North America. Fat Toaster Farm has been an active member of JSBA since 2009, and all of our breeding stock are JSBA registered. For additional information regarding the history and registration of Jacob sheep, please refer to the web pages of the Jacob Sheep Breeders Association at www.jsba.org. One of the special things about Jacob Sheep is that they don’t all look identical. You can tell them apart by their spotting patterns, the numbers and shape of their horns, and their overall appearance. Jacob breeders believe that diversity is an important trait in the Jacob breed!